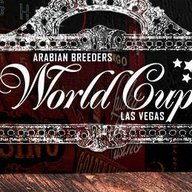 The Arabian Breeders World Cup is a horse event like no other in the U.S., held annually in Las Vegas at the South Point Hotel & Casino. This event has become one of the premier purebred Arabian horse shows in the world. The Las Vegas event is truly an “International horse show,” uniting breeders worldwide. It showcases the natural beauty, nobility, excitement and unique characteristics of the Arabian horse breed and provides a lively and entertaining experience for existing breeders and those new to Arabian horses. The goal of The Arabian Breeders World Cup is to introduce new people to the Arabian horse and to provide opportunities for them to get involved in the Arabian horse industry. All efforts of the AHBA will be concentrated on creating an event that is irresistible to the public -- one that touches the attendee’s heart and soul and makes them think: "I want an Arabian Horse!"